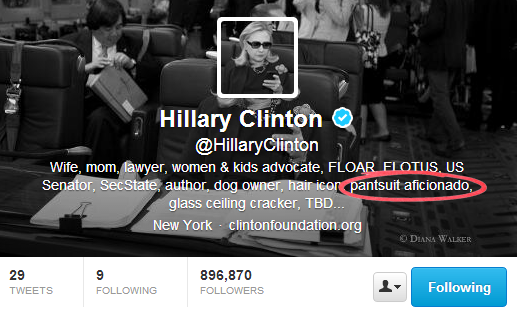 I think most of us, including myself, forget what our Twitter bio is for. It’s not to share what we do, be funny or capture interest from our peers. 2. 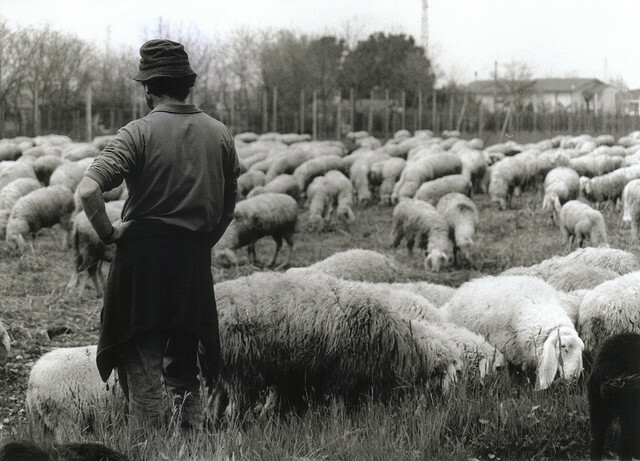 Get those followers to do something. You want to capture someone’s attention, so they follow you. This gives you the opportunity to nurture relationships with people, so the ones who are interested in what you do or sell are more likely to become your customers over time. The smart Twitter bios also invite your followers to do something, encouraging them to take a step towards becoming your customer. 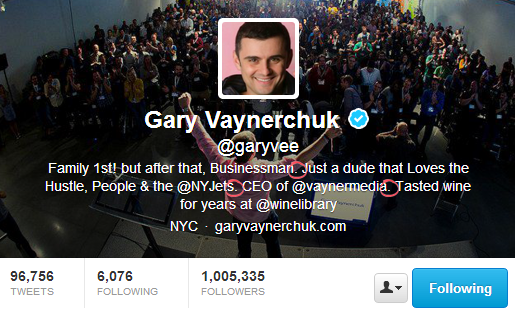 In this post we’re going to go over how to write your Twitter bio so that it converts more customers. 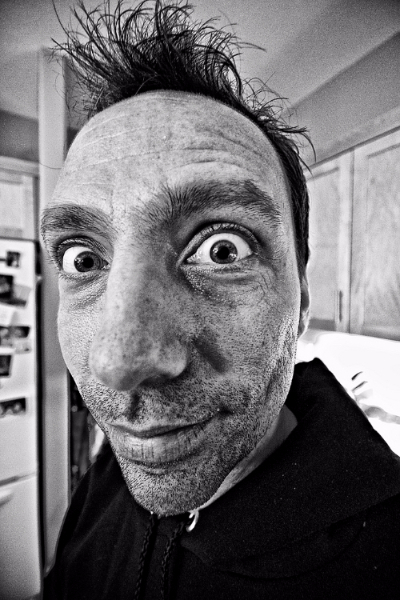 Roughly 8% of people follow you because of the quality of your profile photo. Yes, your bio photo impacts your ability to get customers from Twitter – and more for men than women. Roughly 10% of men follow people on Twitter based on the quality of their photo, and 6% of women do the same. So, put your best face forward. Check out this article from Mashable on 5 Tips for Creating the Perfect Profile Pic to get started. A whopping 95% of your customers don’t care if you have 5, 500 or 50,000 followers. In fact, almost everyone on Twitter (93.6%) has less than 100 followers. So, don’t focus on trying to grow the number of followers you have to make your Twitter bio look better in hopes of getting more followers. Focus on attracting qualified leads – aka someone who will be interested in buying your products or services – and then doing your best to respond to them within 24 hours when they reach out to you. 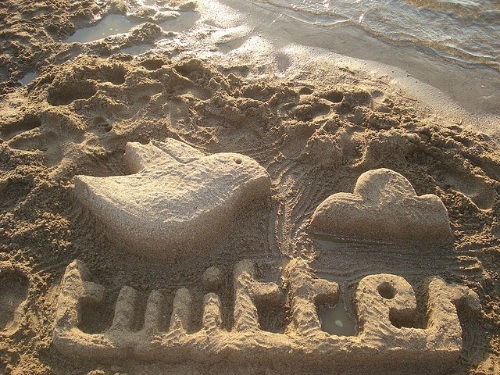 Response time is key to getting customers from Twitter. Not your follower count. You have 160 characters to tell us what you do. And it will give people an idea of whether they may want to be your customer. Remember, the goal is to qualify people and get as many potential customers following you as possible, not get as many people following you as possible. You want to come up in search results when people are searching for what you do. So, feel free to use 1 or 2 hashtags that you think people who are interested in what you do will be using. 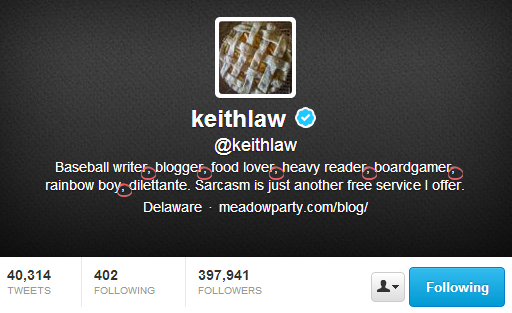 You can use periods, commas or lines to separate what you do in your Twitter bio. As long as it’s consistent. If your business is physically located in a community and your customers visit you physically in your office or store (as your main source of revenue), use your neighbourhood and city in your profile. If you send goods or provide services anywhere in your country (as your main source of revenue), choose your city and province or state. If you send goods or provide services outside your country (as your main source of revenue) and therefore you want to look more international, choose your city and country. Now someone can find you (via hashtags), they know what you do (via a concise description) and they know where you are, what do you want them to do? 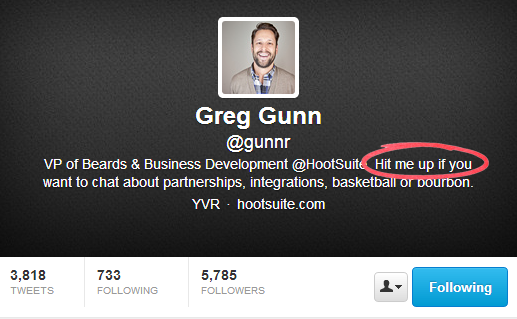 For example, Hootsuite founder Greg Gunn invites you to chat with him if you’re interested in partnerships, integrations, basketball or bourbon. This is a great way to encourage someone who’s interested in what you do to start a conversation, which is a good first step towards building a relationship with them, and towards them becoming your customer. After a 60-80 character description, 1 or 2 hashtags and a quick CTA, you may have room for 1 or 2 words to showcase your personality. This is where you can be creative. Greg included his fun fact as part of his CTA (ex basketball and bourbon), which is a good way to maximize the characters of his Twitter bio and showcase his personality. Make sure you include a link to your website, so your followers know which company is yours. And include the relationship you have with your company. This may be obvious if your name is Bob Smith, your Twitter handle is @BobSmith, your company is Bob Smith Consulting and your website is www.bobsmithconsulting.com. 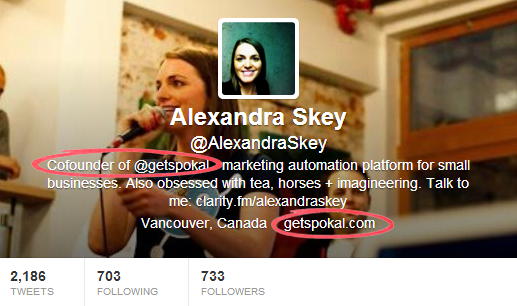 It might not be obvious if your name is Alexandra Skey and your twitter handle is @AlexandraSkey, but your company Twitter handle is @getspokal and your company website is www.getspokal.com. If you have a separate Twitter handle for your business, include that Twitter handle in your bio, along with the relationship you have to your company and your company website. This is why I mention that I’m a “Cofounder of @getspokal” and give Spokal’s website in my Twitter bio. If you really want to capture followers and turn them into customers, make a landing page for first time visitors and use that as the website in your Twitter profile. We use Twitter 6x more on our phones than we do on our computers, so chances are someone will see your Twitter bio on their phone, and if they’re interested, they’ll also visit the website you have displayed on their phone. If you make a landing page that welcomes them and is catered to their mobile mentality (on the go = shorter attention span) using 1 action item they can do – like a quick tip to act on, a short blog post to read or an email list to sign up for – you’re more likely to capture their attention. The goal of your Twitter bio is to capture someone’s attention so they follow you, giving you the opportunity to build a relationship with them over time, ideally converting them to become your customer. How can you build relationships with them? By creating and sharing compelling content. And by responding to all comments and questions within 24 hours. 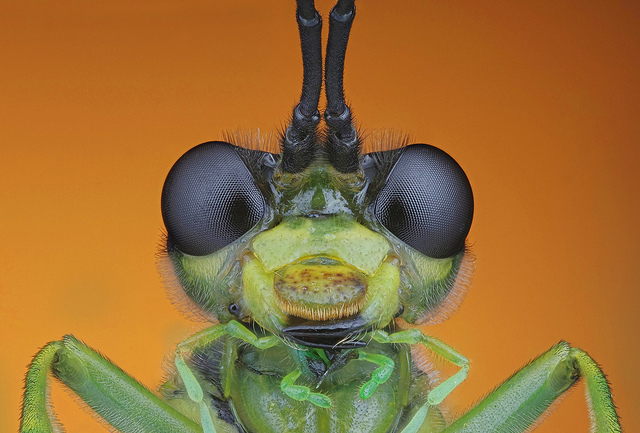 So, what are some of your favourite Twitter bio tips? This is a great post. I need to add some spice to my Twitter bio. Great post! 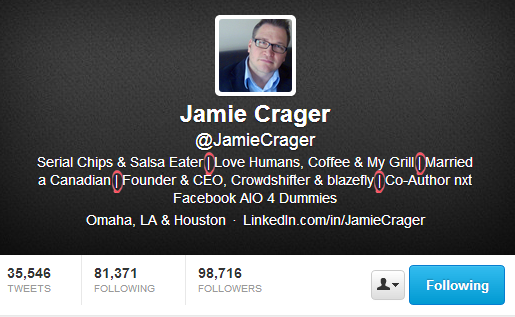 Even as a social media expert,I realised I could tweak my twitter bio a bit better!